Never Enough Nails: Apothica.com GIVEAWAY!!!! Plus my favorite eye product! Apothica.com GIVEAWAY!!!! Plus my favorite eye product! You all know what a product junkie I am by now, right? Nail products, hand creams, cuticle treatments, face masks, hair oils… I’ve posted about all of it! When I find a really good product, I like to share it, even if it’s not nail polish. I have two absolute favorite skin care brands that I just can’t live without. The first is Ole Henriksen- pricey but SO good!!! The second and more affordable line that I want to discuss today is none other than Clinique. Clinique has been the gold standard for caring for troubled, sensitive skin for years. I use many of their products, like their Moisture Surge Cream, on a daily basis. Recently, I discovered their All About Eyes Serum roller ball. 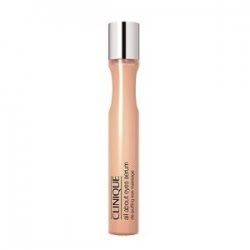 Clinique’s All About Eyes roller ball feels really cooling when you apply it and starts working right away to de-puff the eye area. Personally, I am a bit of an insomniac, so I usually need a LOT of de-puffing. The cool metal roller ball, plus the massaging application really works to get rid of excess fluid around the eye area. This serum is also nicely moisturizing, not too heavy or greasy. Unlike some other eye products I’ve used (trust me, I’ve tried a lot of them! ), this serum does not cause your eye make-up to migrate all over the eye area. I am really pleased with the feeling of All About Eyes serum and the fact that I look less tired when I use it! Unfortunately, I’ve just run out of this serum (hence the stock photo), but I’m going to order more from Apothica.com! Speaking of Apothica.com, I have a $25 gift card to Apothica.com to give away to one lucky reader today (two giveaways in a row, crazy, right???)! You can try out the All About Eyes serum yourself, or maybe order some more polish! They carry Deborah Lippman, SpaRitual, Essie and more. You have three options to enter the giveaway, but you only have to do one. Or you can do all three!! After you have completed one or more of these options, please leave a comment on this post telling me which option you selected, and the name you used to perform this option (i.e. your name on Facebook for Option 1, your Twitter name if you used Option 2, or a link to your blog for Option 3). This giveaway is open to international readers, but Apothica.com does not ship to every country, so check on that first. The giveaway will close on Tuesday May 17th at midnight EDT (midnight New York time for anyone who wishes to keep track). The $25 gift card is valid for use at Apothica.com, SkinCareRx.com, and SkinBotanica.com. lovely giveaway, I'm your new follower! Hey I tweeted about their site (& your giveaway): I'm bananacave on twitter. I will retweet their tweet about this contest...when they post it! I haven't seen them post yours yet. 2. I am opted in for their newsletters. I did the bonus retweet. I wrote on Apothica's wall. Cortney S.